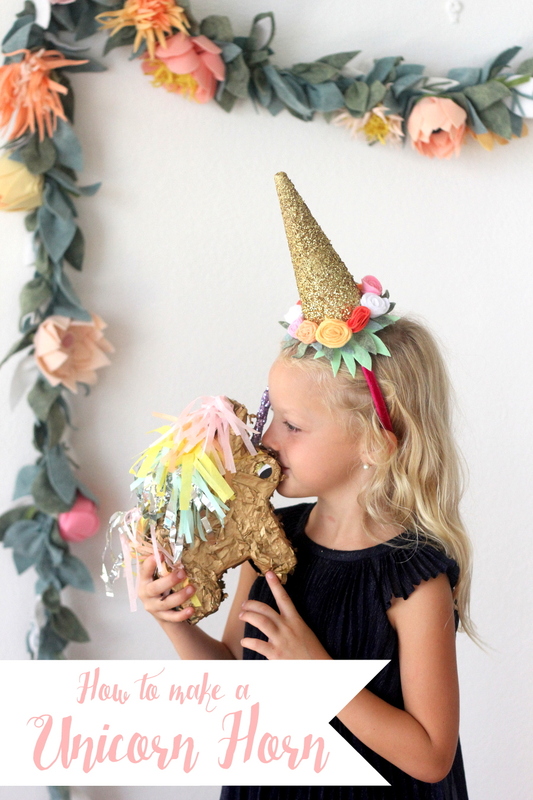 Happy surprise- when you make a unicorn horn for a photo booth at a Unicorn Party and it makes its way to the playroom dress up bin for a life beyond the party. And also sometimes has a third life as bedroom decor. And your daughter wants to wear it as part of her Halloween costume- haha! 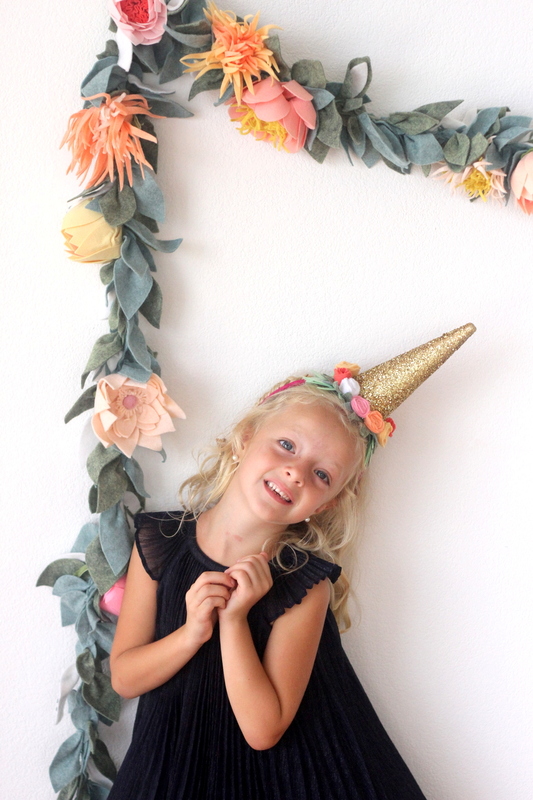 Unicorn horns = much more versatile than I thought. I also made this one entirely with supplies I had on hand, which is a huge win (especially in Saipan The Land O’ No Supplies). 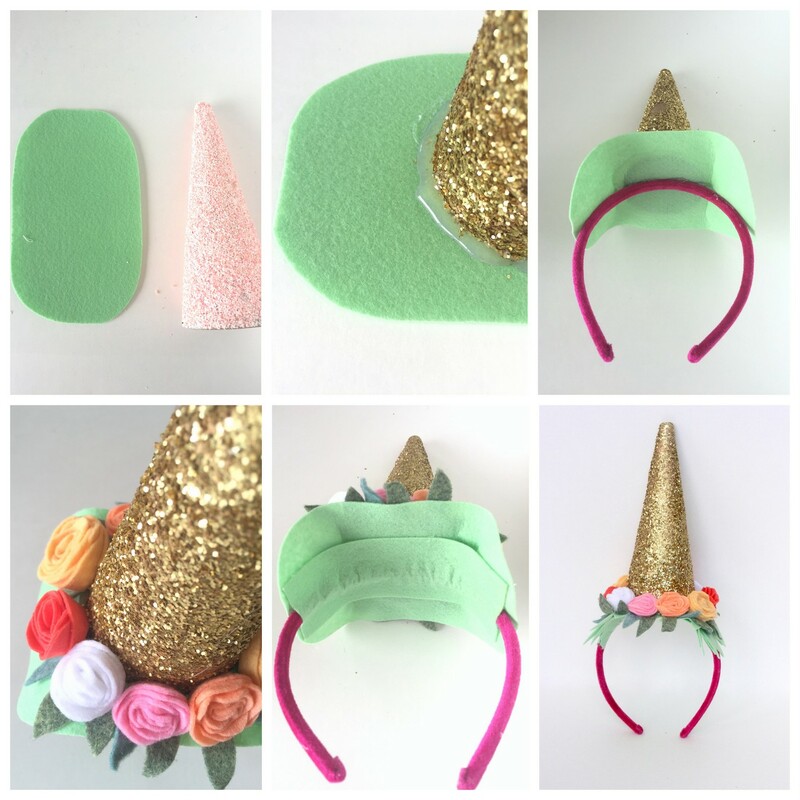 Gather a cardboard cone, glitter, clear gloss spray paint, several colors of felt and a basic headband. 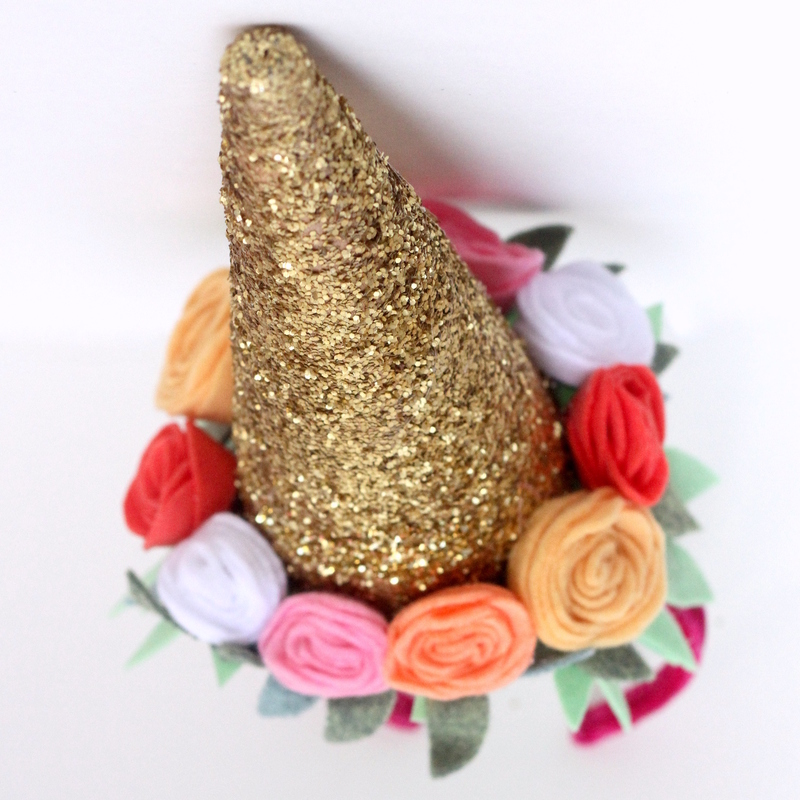 Cover the cone in glitter (I covered in glue, covered in glitter, let dry and then sprayed with clear gloss spray paint). 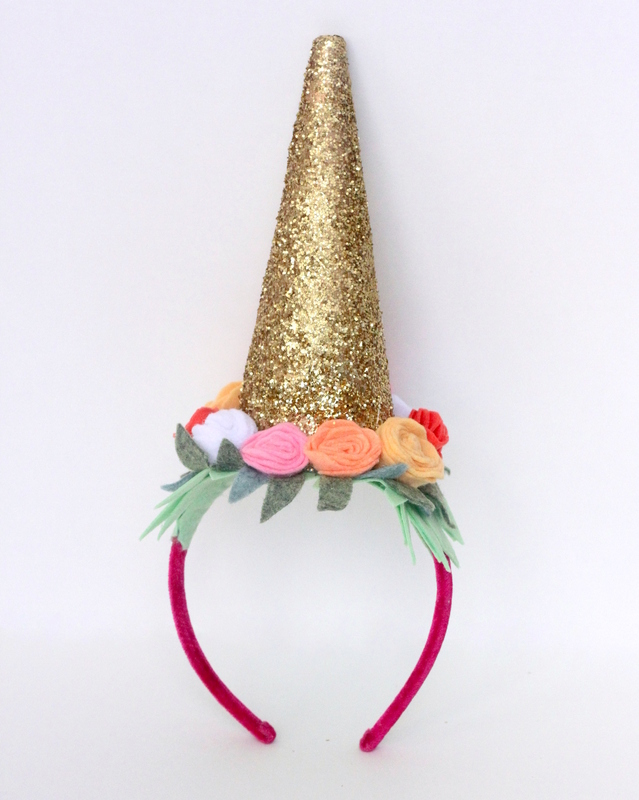 Cut out a felt rounded rectangle ‘base’ that is wider than the cone and spans the top of the headband. Cut out another rectangle of felt in the same color- same length as the base, but skinnier in width (this will go on the underside to secure the base/horn in place on the headband). Also, make a pile of small felt rosettes and a pile of felt leaves. Hot glue the cone to the felt base (run a line of hot glue along the base of the cone, press the cone onto the felt, and then run another thick line of hot glue around the outer perimeter of the cone- be generous with your hot glue, you really want this to stick!). Then hot glue the base-and-horn to the top center of the headband, again, being extra generous with your hot glue usage. Hot glue leaves to the back of your rosettes and then glue your rosettes around your cone/horn. Then glue the backing to the underside of the base, securing the whole thing in place. And you’re done! 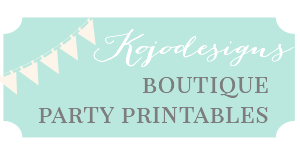 The oh-so-versatile dress up/room decor/photo booth unicorn headband can be checked off your list.